Alright. The map (equal-area Mollweide projection) answers the question: where would I end up if I drilled straight through the center of the Earth and out the other side (besides “dead”)? Or: If Earth were transparent, what’s directly below. It can also help (through some mental gymnastics) to determine whether the shortest route to a far-off location has you traveling east or west around the globe. Here is another version of the map, centered on 180° longitude (the other is 0°) so that edge-distortions on the one are not egregious on the other. Clicking on the images (right click to save) should afford a higher resolution view. What else is there to say? Well, allow me to make some observations. As a kid, whenever I dug a hole, an adult would invariably comment that if I kept going, I would end up in China. Perhaps. Kids are not particularly skilled at digging straight down. But I am at least consoled that there is some place in the world where that statement is true. It’s your job to find it. There is an uncanny ability for continents to avoid each other. Just look at Australia perfectly centered in the North Atlantic! And the largest land gathering on the planet (Asia+Europe+Africa) manages to tuck almost completely into the largest ocean, even though said ocean is adjacent to the land mass (not wholly on the other side of the planet). 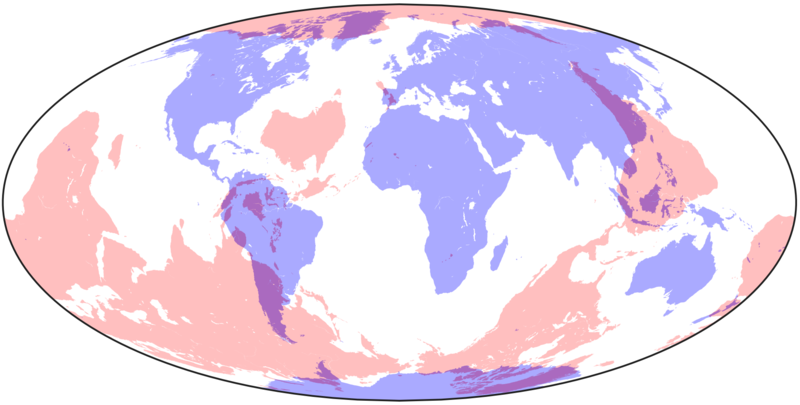 North America is pretty clean in the Indian Ocean, save the polar regions. By the numbers: 28.5% of the Earth’s surface is land, so randomly one would expect just over 8% overlap (square of 28.5%). But in actuality, only 3.8% of the land overlaps opposite land. Put another way, given that you are on land, the chances of finding land opposite is not 28.5%, but 13%. So the systematic arrangement of continents causes a deviation from random expectations by a factor of 2, which is a large effect. 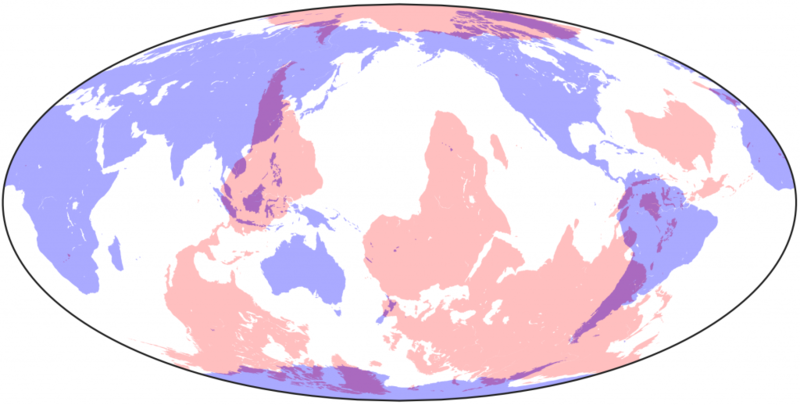 It would have been even more striking in the age of Pangea, when roughly 0% of land would find land on the opposite side. So we’re halfway between Pangea and random scatter. The cutest pairings for me (besides the China overlap) are New Zealand–Spain and Hawaii–southern Africa. The former is just somehow striking to me, while the latter carries significance for some friends of mine who split their time between Hawaii and Namibia (among other far-flung places). In fact, one of them moved from South Africa to Hawaii as a youngster: hard to contrive a more distant move. Despite keeping a low profile on Do the Math, I am very busy otherwise. I intend to report soon on two major personal explorations: a plug-in car used mostly as an EV (two years now) and nickel-iron batteries for my solar setup (a little over one year). Battery assessment takes time, and I have accumulated an overhang of data to crunch. While I certainly have good things to say about both, my mantra that batteries disappoint is no less true. I have turned off comments, since I have a busy couple of weeks ahead and I did not post anything substantial enough (in fact, it’s transparent) to invite obviously insightful reflections/perspectives. This entry was posted in News/Updates and tagged visualization by tmurphy. Bookmark the permalink.